Back at the FGS 2011 conference in Springfield, Illinois. Someone came up to me and said, "George Morgan is looking for you." Hmmm....it is never a good sign when someone is "looking for you" at a conference. It means he or she wants something. A favor. Sometimes to chair something to be on a committee. Now I know George and consider him a dear friend, but he is a Very Important Genealogist with lots of acquaintances. Why was he looking for me? Because George is a very busy guy (FGS Vice-President, successful businessman, equally successful podcaster, etc. ), I did not see him right away at the conference. This led the curiosity and worry to fester. I thought about all the horrible imaginary possibilities of volunteer opportunities passed on by everyone else. He probably had me in mind for the one post nobody would cover, like the complaint booth or committee to oversee paint drying on the walls. Finally, after a day and a half at the conference, I did see George Morgan on the exhibit floor. It was time to meet my fate. He said that the FGS Forum was changing some things and wanted to know if I was interested in writing a column about genealogy society blogging. I was so relieved not to be relegated to the complaint department that I said yes before he was done with his sales pitch. Fast forward many months and my first "Genealogy Blogging" column just came out in the Spring 2012 issue of FGS Forum. Thank you to the FGS officers for the nod and vote of confidence. Since I am so evangelical about the power and ease of genealogy blogging, this writing gig doesn't even feel like volunteer "work." It's what I preach every day. My first column highlights blogs from the Tri-State Genealogical Society of Evansville (IN), Wood County (TX) Genealogical Society, Indiana Genealogical Society, Hamilton County (OH) Genealogical Society, DuPage County (IL) Genealogical Society and the FGS Voice. FGS gave me ample control of the intended direction of the "Genealogy Blogging" column. Topics will vary with each issue, but the common theme will be the use of blogs for genealogy societies. If your society has a blog, let me know. I'm always looking for blogs to feature, topics to cover and questions to answer. So join me as we help genealogy societies raise their online presence and reach out to a growing audience that's been raised on technology. It's a great time to be a genealogist. Don't subscribe to Forum? Get it here for only $15, or $25 for 2 years. Or better yet, encourage your genealogy society to join FGS and get all the wonderful perks and benefits that come with membership. SOCIETY FREEBIE: 25 Great Topics for Genealogy Society Blogs. Free download. Share it with your friends and fellow society members. I told you I was serious about genealogy society blogging. Thank you! That means a lot. Let me know if there's anything you want me to cover. George, no worries! I'm just thrilled to be part of the team. 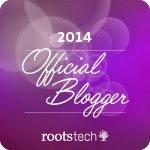 At RootsTech 2012 someone said, "Pat Oxley is looking for you." That's when I was worried, but it turned out to be something fun relating to FGS 2014.